Obstructive stomach or intestinal foreign bodies (FB) occur when a pet eats a non-food foreign object and it cannot pass through the gastrointestinal (GI) tract. Foreign bodies can be toys, socks, pantyhose, string, bones, and even mulch. These items can become lodged under the tongue, or inside the esophagus, stomach, or intestinal tract. Sometimes FBs can become lodged in multiple locations in the GI tract if they are composed of string, fabric or carpet (i.e. linear FBs). Foreign body obstructions are among the most common causes for emergency veterinary surgery. What are the Clinical Signs of a Foreign Body Obstruction? The clinical signs (symptoms) vary based on the GI tract location and duration of the obstruction. The most common clinical signs of a foreign body ingestion are vomiting, loss of appetite, nausea, diarrhea, abdominal pain, and lethargy. How is a Foreign Body Obstruction Diagnosed? A physical examination and blood tests are often performed to rule out other causes for the observed clinical signs. Abdominal palpation is important in the diagnosis of an obstruction, but advanced diagnostics are often required for confirmation. 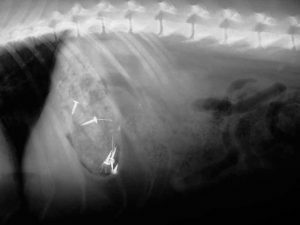 Abdominal radiographs (X-rays) are the most common diagnostic test performed to help visualize evidence of a FB/obstruction. Often the FB itself cannot be seen but the consequences of the foreign body obstruction are visible. These include fluid and gas building up behind or within the foreign body. If the radiographs are not diagnostic, often an abdominal ultrasound may be performed to aid in determining the cause for the clinical signs. What are the Risks of a Foreign Body? The location of the FB, the material it is composed of, and how long it has been present will all influence the consequences of the FB obstruction to your pet. If the FB material is made of a metal, such as lead or zinc (such as building materials or pennies), the metal toxicity can cause signs of anemia. Severe dehydration and electrolyte changes can occur when a FB obstructs the stomach or intestines. Additionally, the obstruction can cause can cause pressure damage to the wall of the GI tract and lead to a perforation. This hole allows GI tract fluid to leak out of the intestines and can cause a severe infection and shock which can be life threatening. What is Done to Remove the Foreign Body? 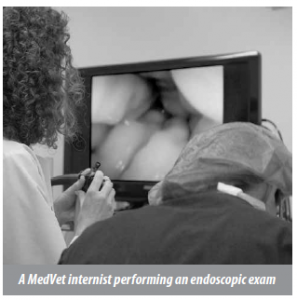 If the FB is located in the esophagus or the stomach and is small enough, it can sometimes be removed with nonsurgical endoscopy (using a scope). However, if the foreign body is sharp or too large it may not be amenable to safe removal with a the object is located and the health of GI tract that is obstructed. The longer the FB is lodged, often the worse the damage to associated GI tract. Surgically opening the stomach or intestines is often performed, but sometimes, a damaged section of GI tract needs to be removed. The most serious complication of removing a FB is that the intestines could leak from the site of removal. The stomach rarely leaks after FB removal, but the risk of the intestines leaking after being opened or after a section is removed is approximately 5-15%. Intestinal leakage is a serious consequence because the intestine’s contents can cause diffuse infection in the abdomen. Patients with this complication must be returned quickly to surgery for the area to be closed. The highest risk of leakage is 3-5 days after surgery. Other potential complications include skin incisional infections or incisional openings (dehiscence). These complications can be minimized with appropriate post-operative care including exercise restriction and prevention of licking for 2 weeks. Other risks include general anesthesia, and sutures breakage if there is too much activity within the healing period. What do I Expect after the Foreign Body is Removed? Most pets start to feel better quickly after the FB is removed because of the pressure relief and the reestablishing of flow within the GI tract. However, the GI tract may be inflamed and irritated from the presence of the FB. This can result in persistent nausea, loss of appetite and may take days to resolve. It is also not uncommon for animals to continue to regurgitate food or fluid for a few days after surgery. During this recovery process, it is very important to rehydrate your pet and return the electrolytes to normal. It is common for your pet to not eat well and feel nauseous for a few days post operatively from the presence of a foreign body. It is also common for your pet not to defecate for up to a week following surgery.